Why not join us on Facebook? We only post about useful things like new releases, and unlike some others we promise we won't spam you with meassages! 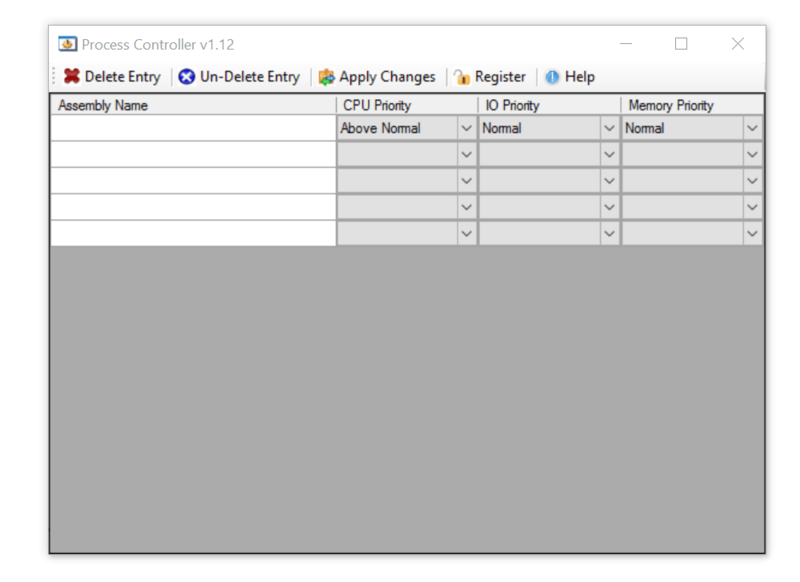 Process Controller gives you the ability to specify CPU, RAM and IO priorities for any running Windows process, and have it persist between process restarts and reboots. Process Controller belongs to that small select group of applications whose functionality really should have been available in Windows out of the box many years ago. For years Windows has shipped with a very advanced thread and process prioritisation engine. Yet this powerful feature has been out of reach for end users unless they were prepared to spend hours trawling various online resources looking for information about numerous partially documented registry entries, then spend just as long experimenting trying to pin down the correct combination of values on a test system. Process Controller takes all the guess work out of things by providing a friendly and easy to understand interface through which you can control this incredibly powerful Windows feature. The simple interface lets you specify the CPU Priority, IO Priority and RAM Priority of any process running on your Windows Operating System. You can set the above priorities and they will permanently apply to the chosen processes, persisting whenever the process are launched. Unlike a 'right click' and 'Set Priority' in Task Manager you can specify CPU, IO and RAM priority and the setting will persist even when the process is restarted. Whether you have an SQL database server or Exchange server that is fighting with it's backup agent for resources during backups, or a Terminal\Citrix server which is being pestered by one particularly hungry user launched process.. Process Controller has the anwser! Set CPU Priority - Permanently assign a CPU priority to any process to avoid CPU contention issues. Set IO Priority - Permanently assign a IO priority to any process to maximize the performance of critical applications. Set RAM Priority - Permanently assign a RAM priority to any process to prevent it consuming physical RAM. It's such a simple enhancement to the operating system, but it's incredibly powerful.